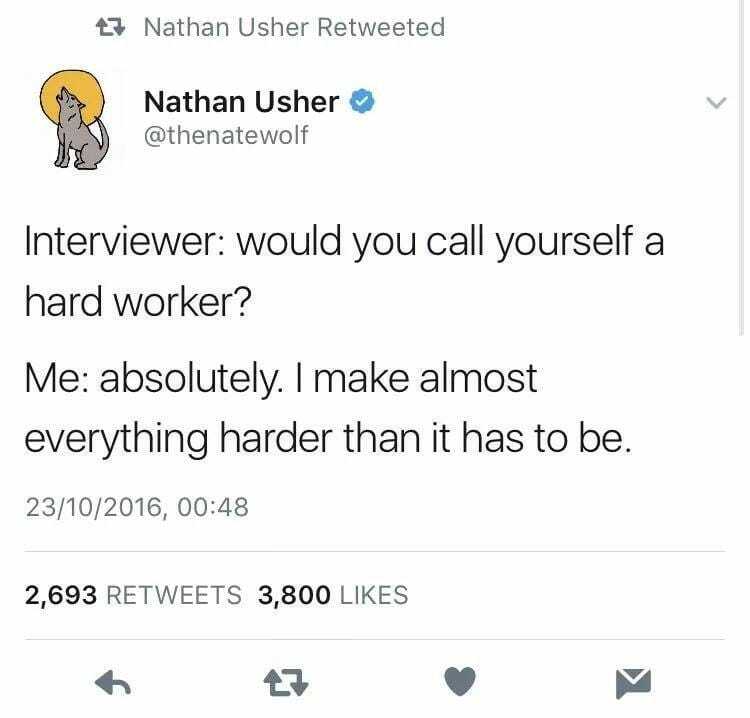 Yes, I am a hard worker who happens to make almost everything harder than it has to be. And that unfortunate bit of personal truth functions in me much to the dismay of damned near everyone. Month for Loki, Day 28: Celebration. Did you know that July 28th is Peruvian Independence Day? Much like Fourth of July in the US – Peruvian Independence Day is celebrated with much food, drink, and revelry in the form of dancing, music, and singing. Yes, we drank and ate some great barbecue. And, as it is a tradition in her family, both my husband and I were persuaded into not only singing karaoke, but dancing. And so, I finally did just that. I danced several rounds and I sang not one but several songs, much to the surprise of my husband and children. There was such an air of joyful celebration throughout the day. My husband and I felt honored to be invited to share in that joy, and I can honestly say that the hours (yes, hours!) flew by. It was truly an amazing day. It consists of Pisco – a clear brandy made of fermented grapes which originate from Peru. 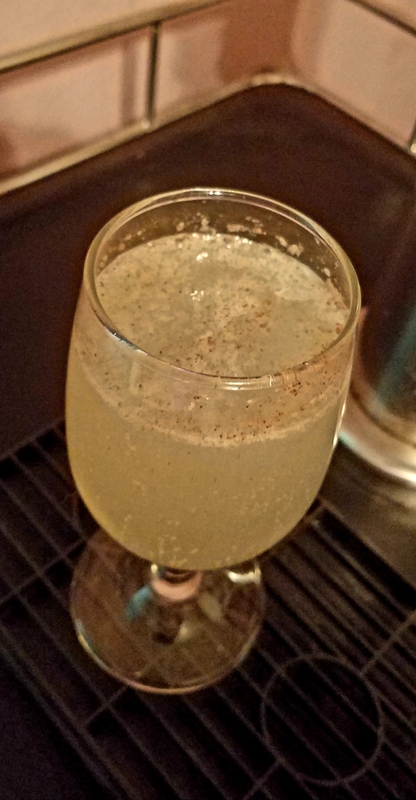 The traditional form of the Pisco Sour contains a shot and a half of Pisco, an egg white, a dash of simple syrup, and a sprinkle of cinnamon. Or, in the case of a quick fix – a shot of high-quality Pisco, a splash of ginger ale, and a few lime slices. 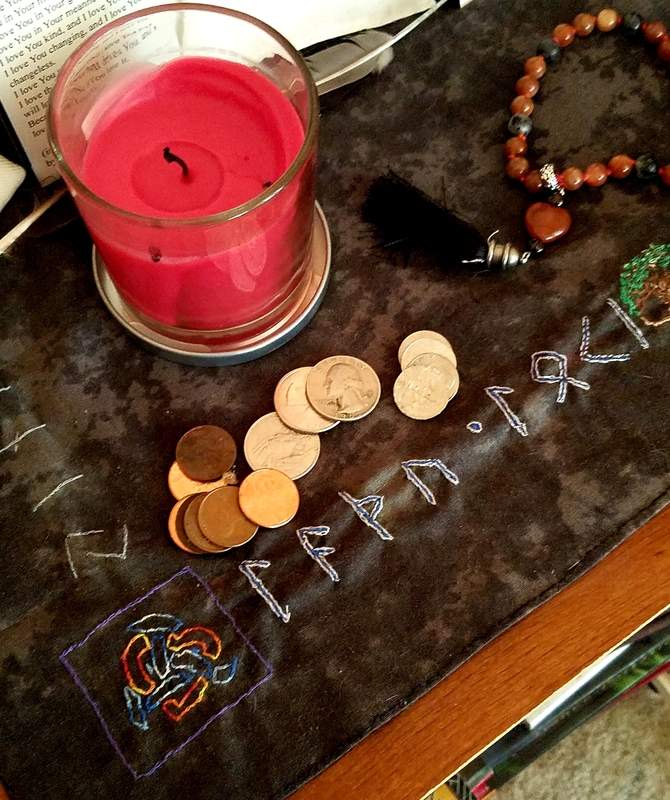 Why is there a pile of loose coins on Loki’s altar? Many devotees see Loki as a God of Change – both in terms of money and in transformation. Loki has provided me with both forms of much-needed ‘change’ many times in my life – whether it be a random quarter or two to make a call on a pay phone (I know I’m dating myself there) or nudging me towards the Thing I Thought I Could Not Do. It makes perfect sense to me, on several levels. As a result, a lot of the loose coin change I find in the course of the day will often find its way onto His altar…especially dimes and quarters. Otherwise known as ritual distractions. I know it’s been a while, but isn’t it always? I cannot say that I haven’t been writing – because I have – but as usual, I haven’t been posting as often as I’d intend. There’s something about the ritual of sitting in this chair and writing that works for me, and yet, posting rarely seems part of that process. I have been thinking a lot about processes and rituals as I am currently overthinking..er, writing…a small collection of rituals. Perhaps it is more of a devotional, as much of what I’ve written leans more towards personal devotional rituals for the solitary practitioner. At any rate, it is as it has always been…though I have been writing, I have not been posting in this blog. It occurred to me that I have been dragging my feet lately, as I resolved in the new year to focus more upon not just writing but organizing my devotional practice into something much more coherent than it has been. Long have I been getting the nudge to consolidate the jumble of notebooks and computer files into a consistent organized whole. I know that my life could benefit from a more structured approach…and yet, the more I focus upon the task of collection and consolidation, the more scatterbrained I feel. I feel like a student all over again, hunched over my desk, busily compiling five years’ worth of devotional writing from the stack of notebooks, the relevant pages clinched by paper clips with worn covers peppered with Post-It notes. In an attempt to help, my son suggested that I try using a ‘fidget cube’ – a desk ‘toy’ designed to help one focus – as he claims that being allowed to use one in class has improved his ability to focus while writing. So, I held the fidget cube in my left hand while I transcribed my notes on Anglo-Saxon runes and a Beltane bonfire ritual into my laptop. 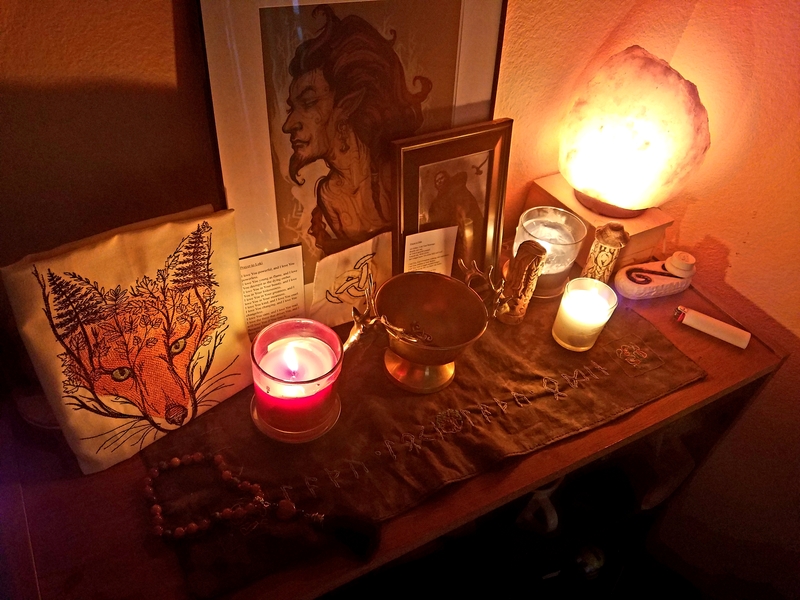 Later that evening, when I was sitting in front of my altar, attempting to meditate, my mind kept wandering toward other things. Distracted by thoughts of runes, bonfires and masks, I struggled to push those thoughts and attendant vivid imagery aside. I opened my eyes, and my gaze settled upon the mala beads that lay atop the cigar box in the center of my altar. Recalling how this mala had helped me focus in the past, I reached for them, closed my eyes, and settled into the words of the prayer that I had created for them. While the prayer I created for them is simple and almost repetitive in its rhythm – as that is exactly what I need when I have difficulty focusing – I have said this prayer so regularly… that it suddenly became clear that something wasn’t working. My breathing felt off, and my thoughts kept trailing off in strange ways so much so that I kept losing track of the words. Disturbed, I opened my eyes, and looked down at the beads in my right hand…as if the beads were the problem. Funny that…because I know better. But it definitely occurred to me that I needed to do something else to focus. I thought about that fidget cube on my desk in the other room. It seems to have always been true of me that in order to force my mind to be still, I have to be doing something. I have to be moving in some way, however small or slight. And so I reached for the fidget cube. And so I settled into that. So here’s to a different technology, I guess. Though now that I think about it…it did sound a lot like typing. 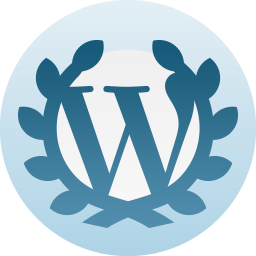 On the 29th of May 2012, I signed up with WordPress, deciding to keep a blog.